Apr 25, 2017 | Allergies, Childhood Illnesses, Health Tips, The Doc is In! Sending a child with food allergies out into the world everyday is a source of anxiety and fear for parents and caregivers.The U.S. Centers for Disease Control reported that food allergies result in more than 300,000 ambulatory-care visits a year among children under the age of 18. Parents of children with life-threatening food allergies have the same worries and fears as all parents do in regards to water safety, stranger danger, carseat safety, etc., but carry an additional weight of worries that is often induced by a well-intended adult (or child). Please read on for some pointers for everybody on keeping children with food allergies safe. Do not offer food to a child without knowing if they have allergies. Seems simple, right? Unfortunately, researchers estimate that up to 15 million Americans have food allergies.This potentially deadly condition affects 1 in every 13 children in the U.S. That’s roughly two in every classroom. Since children are not in the market of driving themselves to the grocery store to shop for groceries alone just yet, it’s up to all of us to be responsible and never assume it’s okay to offer food to a child whose allergy history we don’t know. Teach your children about food allergies and the importance of not sharing food. Older children with food allergies learn their food restrictions and do well with communicating their food allergies to others. Younger children (preschoolers especially) love to share food, which can be potentially dangerous to a fellow preschoolers with food allergies. While some schools regulate food allergies with “nut free classrooms” or even “nut free schools,” remember that food is everywhere. Also, it’s important to know that it’s not just nuts that can cause an allergic reaction, any food can be a source of food allergy for a child or adult. Whether it’s the park, a birthday party, or a playdate with friends, it’s important to teach your young children that while sharing toys is wonderful, but sharing food is generally a no-no. Be cognizant of the snacks you give your child when other children are around. When you and your child are out and about, be mindful about the snacks that you give your non-food allergy child. Snacks eaten by other children could potentially harm a child with food allergies if the children are playing in close quarters. When out and about at the park, before dance class or sports practice, or at a mommy and me class, best-bet snacks are self-contained foods that don’t leave crumbs. Wrappers should be thrown away and out of reach and hands should be thoroughly washed with soap and water after the snack is eaten. If you’re hosting a party, a playdate, or even giving out Halloween candy, there are ways to accommodate all guests, including those with food allergies. 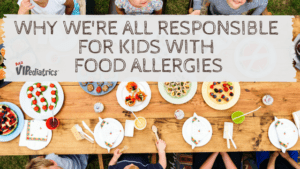 Consider asking the parents when they RSVP for their children if there are any food allergies, offer non-food alternatives in goody bags, and consider pre-packaged snacks and foods to avoid cross contamination.